When you have bulk mail to send to people on your mailing list, you can use mail merge to create a batch of personalized letters. Each letter that is produced has identical layout, formatting, text, and graphics. Only specific sections of the letter vary and are personalized. This document contains text and graphics (a logo or image, for example) that are identical for each version of the merged document. The body of the letter is an example of identical content. This is the data source that is used to populate information in the letter. Your mailing list has names, for example, and your main document is the letter that will be addressed to the names in your list. This document is a combination of the main document and the mailing list. Mail merge pulls information from the mailing list and puts it in your main document, resulting in a personalized letter for each person. You can learn more about how mail merge for letters works in the following video that is part of a training course. Before you begin the mail merge, prepare your letter. If you’re letting people know about an upcoming event, for example, include the name, date, time, and location of the event. It's those details that would be important to all recipients of your letter. On the Mailings tab, in the Start Mail Merge group, choose Start Mail Merge > Letters. In Word, type the body of the letter (example follows) you want to send to everyone. The mailing list is your data source. It can be an Excel spreadsheet, a directory of Outlook contacts, an Access database, or an Office address list. It contains the records that Word uses to pull information from to build your letter. If you don’t have a mailing list, you can create one during mail merge. Before you start the mail merge process, collect all of your data records, and add them to your data source. Now you're ready to open the data source for your mailing list and link it to your letter. If you’re creating and printing letters for everyone on your list, go to "Step 4: Add personalized content to your letter." If you want to send letters to people who live, for example, within 20 miles of an event you're hosting, then use a filter like a ZIP Code or a postal code to narrow the list. 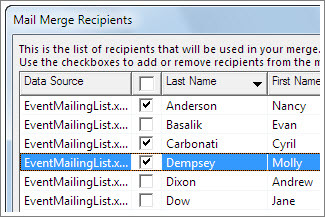 In the Mail Merge Recipients dialog box, select the check box next to the name of each person who you want to receive your email message. 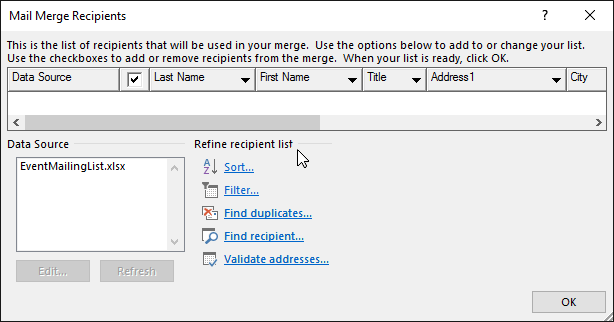 In the Mail Merge Recipients dialog box, there are options to refine the recipient list. The two most frequently used options are to sort and to filter the list to make it easier to find names and addresses. For more detailed information, see Sort and filter the data for a mail merge. Add content to your letter that’s different for each person who receives it—for example, their name and address. The best practice for adding these details is to insert merge fields in your main document. 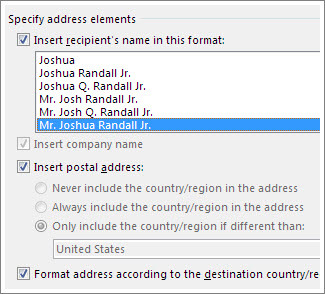 In the Insert Address Block dialog box, choose a format for the recipient's name as it will appear in the letter. Note: To view how an address will appear in the letter, under Preview, choose Preview Results. Choose the Next or Previous record button to move through records in your data source. Choose OK to insert the merge field in the letter. Choose File > Save to preserve the letter (example follows) you're creating for the mail merge. 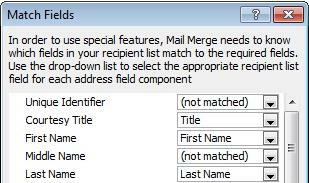 To insert other custom information in the letter from your mailing list, see add mail merge fields one at a time. When you save the mail merge document, it stays connected to your mailing list so that you can use it for your next bulk mailing. In Word, type the body of the letter you want to send to everyone. If you're using an Excel spreadsheet, make sure the column for ZIP Codes or postal codes is formatted as textso that you don't lose any zeros. You can also use your Apple contacts, make sure Apple mail is your default mail program. Use FileMake pro database as your datasource for mail merge. In the Edit List Fields dialog box, Word automatically creates fields for some basic information, such as first name, last name, and address. If you want to add a new field—for example, a message field—add it now, so you can fill it in when you type the entries. Under New field name, type the name of the field you want to add and then choose the plus sign (+). Tip: To change the order of the fields, select the field you want to move, and then use the up or down arrows to move the field where you want in the list. When all of the fields are set up the way you want them, choose Create to create the list. 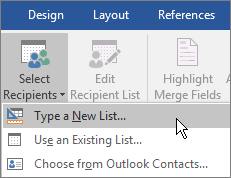 If you chose to open an Excel spreadsheet, In the Open Workbook dialog box, select the sheet you want to use, and leave Cell Range blank to use the entire worksheet or enter a cell range for the data you want to use, and then choose OK.
For Outlook contacts, in the Query Options dialog box, next to List mail merge recipients by, select Complete record. In the list of contacts, select the contacts you want to send bulk mail, and then choose OK.
For Apple contacts, in the Query Options dialog box, under Apple Group Contacts, choose the group you want send bulk mail and then choose OK.
On the Mailings tab, choose Insert Merge Field and select the field you want to add. Continue adding fields until you've added all the information you want on your letter. Format the fields in the letter so it looks the way you want the rest of your envelopes to look. For example, include a space between First and Last name fields and press Return to start a new line for the Address field. Tip: To sort your recipient list or remove recipients, on the Mailings tab, choose Filter Recipients, and then choose Sort Records or Filter Records. When you're done, choose OK.
On the Mailings tab, choose Preview Results to see how your letter look. Use the left and right arrows on the Mailings tab, to scroll through each letter. 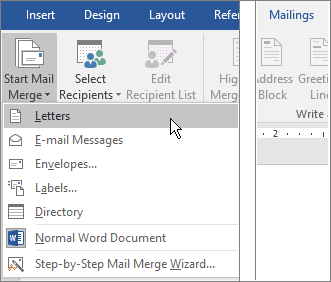 When the letters look how you want, on the Mailings tab, choose Finish & Merge > Print Documents to complete the mail merge. 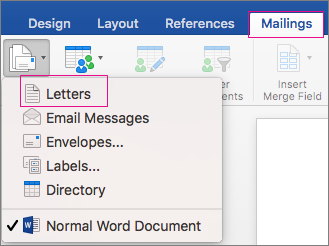 Tip: If you want to review and update each letter individually before printing, on the Mailings tab, choose Finish & Merge > Edit Individual Documents. When you're finished, click File > Print to print the envelopes.